In an effort to save a little in calories (and a lot more in dollars) we've been trying to have more meatless meals. After spending the weekend, and into Monday, grilling up several different species (I didn't even post about the beef skirt steak) I opted to use tonight to catch up on some meatless meals. 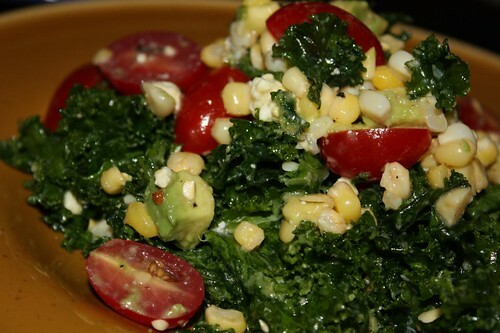 For salad I tossed some kale with leftover grilled corn, grape tomato, feta, avocado, cayenne, cumin, lemon, salt, and pepper. This was quite possibly one of the finest kale salads I've made in a long time. I made a quick pasta sauce with tomatoes from Migliorelli Farm; squash from Homestead Farm in Orance, CT; onions; white wine; and garlic. 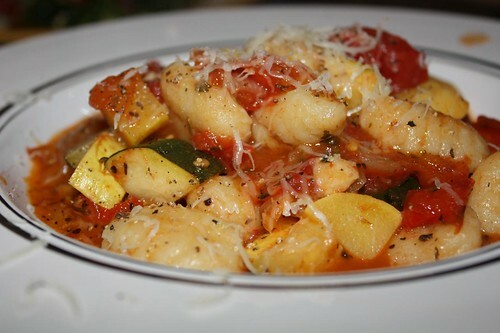 I cooked some Severino gnocchi and tossed it into the sauce to finish. This made enough for about four bowls and cost somewhere in the neighborhood of $8.00 to make. 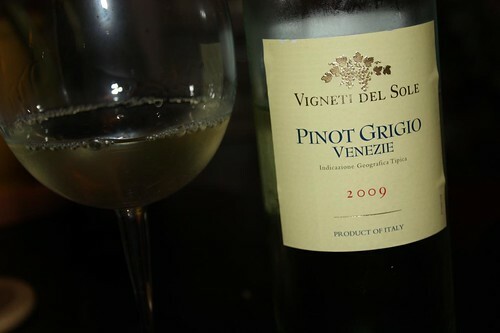 There's nothing better than deciding that you need to open a bottle of wine specifically to cook with then making the noble decision that you can't just waste the rest, you must drink it! Of course since we are not characters from a book in the mid-Twentieth Century, we cannot even finish one bottle of wine between the two of us. The best we can ever do is maybe join forces to polish off half a bottle, including the bit we used to cook. I believe we are what's termed in the business as lightweights.